At the invitation of some friends of mine, I was asked to join a group of nature/culture lovers, Grupo Terra Verde, on an amazing walk, on Saturday Sept. 3rd, from the city of Porto following the coastal route (north of Portugal) into Galicia, Spain with a final destination of Santiago de Compostela. The ‘Caminho de Santiago’ as it is known is not an uncommon walk for pilgrims following the traditional and very beautiful inland route. For the first time however, this coastal route was chosen as something different, following the rugged Atlantic coastline along beaches and the wild rocky outlets until, towards the last sector, it would swing inland to reach the beautiful and historic city of Santiago de Compostela. It will be done in 6 sectors and the first from Porto to Vila de Conde, 24 kms, was our start. 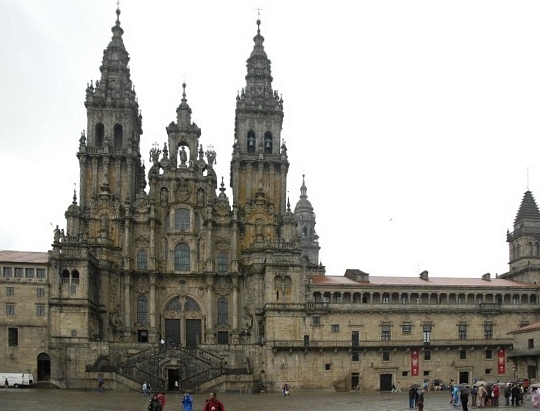 Firstly though a bit of history about the Caminho de Santiago (Road to Santiago). This centuries-old religious pilgrimage route extends throughout the Iberian Peninsula to the city of Santiago de Compostela, located in the extreme western Spain, where the tomb of the apostle James was enshrined. James had preached in the westernmost province of Spain but was beheaded on orders from Herod. His remains were thrown outside the city walls but secretly taken back afterwards to be buried in a forest in Libredón. This location remained hidden for eight centuries until one night a hermit called Pelayo observed a phenomenon of stars showering over Libredón. The bishop at the time, ordered excavations and on July 25th (probably) 813 a chest with the marble remains of the apostle James was found. News quickly spread and the site was visited by walkers from all over Europe to see the tomb of the saint. The number kept increasing with each year and included noblemen and peasants in caravans, on foot or on horseback in search of blessings, cures for diseases, keeping promises or just venturing into distant lands. King Alfonso II ordered a chapel to be erected on the site in honor of St. James, proclaiming himself the guardian and patron of all his realm. Soon, a city called Compostela was built around that forest. The etymological origin of the name refers to the Latin: Campus Stellae or Field of Stars thus resulting in “Compostela”. Later in 899, King Afonso III built a basilica where the rustic temple had been erected by his predecessor, but eight years later it was sacked by the Arab, Almanzor. In 1075 work began on the construction of the present cathedral, five times higher than the last. The Road to Santiago has a medieval look of Romanesque and Gothic cathedrals, monasteries and chapels, together with castles and Celtic villages spread out along the way. The height of the pilgrimages occurred in twelfth and thirteenth centuries with four main routes originating in this period. Although starting from different points, all entered the Iberian Peninsula through the Pyrenees. Modern day routes also begin in cities such as Saint-Jean-Pied-de-Port, France. From the 14th century, there was a significant drop in the number of pilgrims venturing out on the route, however, in the 20th century the Caminho de Santiago was “resurrected” and once again became one of the main routes of religious history. Today it is not uncommon to find modern pilgrims travelling on foot or by bike, or simply those who take a day or two to visit the cathedral and tomb of the Apostle St. James. 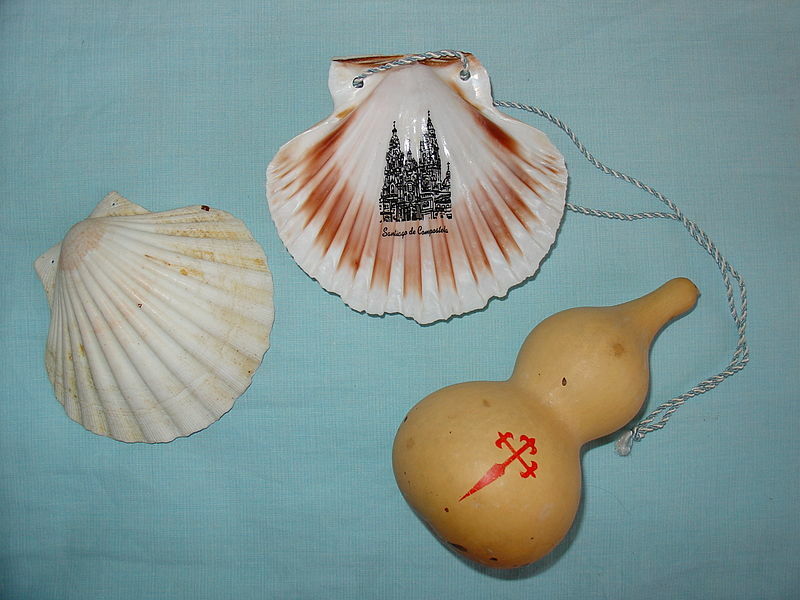 Generally the traveller carries a scallop shell that has several meanings. According to legend, a man covered the distance on horseback when the animal suddenly shot toward the sea. The pilgrim evoked Santiago and a strong wave brought him back to dry land. Regaining consciousness, the stranger noticed his robe was full of shells. Thus, the scallop shell took on the meaning of protection which is also associated to the Grail. It symbolizes wisdom and the authority of Christ as a Higher Self for the traveller. Along the way, one can encounter hostels built into old medieval buildings specifically tailored to meet the pilgrims’ needs. Besides the hotels and inns many people often offer their own homes as shelter. The pilgrim carries a credential, which must be stamped in churches or in the body corresponding to a local tourism office. Armed with a map, the traveler also has the discrete arrows painted on rocks, walls and trees which act as a constant guide to prevent the adventurer from getting lost. When the journey is completed and the pilgrim arrives at the Cathedral of Santiago in Compostela, credentials are shown and a certificate is received to confirm that the entire route was completed. 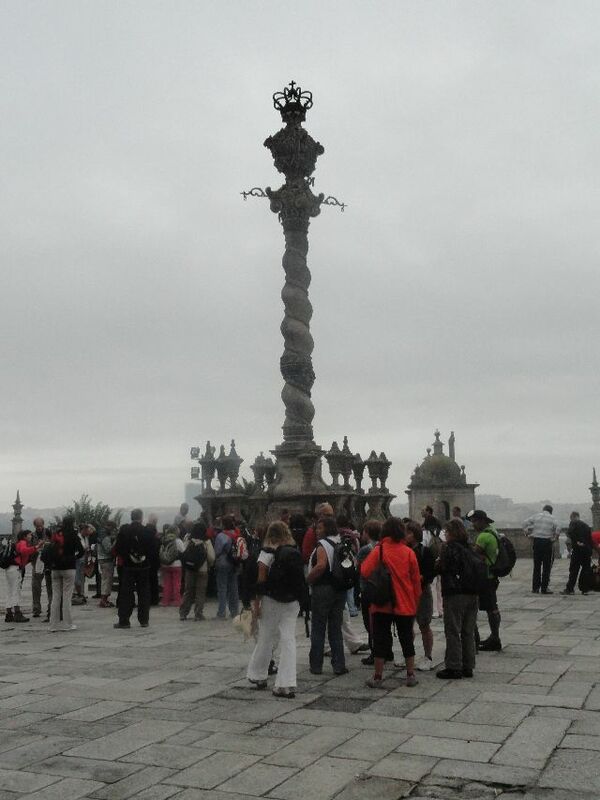 Our meeting point was the Sé Cathedral in Porto at 7.45 a.m. where a group of 70 of us met on a grey morning to start our journey and after a quick briefing, group photo and hand out of the official credentials to everyone, we got away. Walking down through the narrow streets in the old sector of Porto is just amazing and we found ourselves in no time on the River Douro waterfront walking along the embankments eastwards to the Atlantic Ocean. It was fascinating to see all the beautiful old buildings, some in good condition, others in ruins and our group historian gave us a running commentary on some of the history of the city. The Douro River gave way to the Atlantic Ocean and as the day cleared and we headed north, we experienced wonderful weather, beautiful typical scenary and many interesting people along route. Photo slideshow below as we walk the route. This entry was posted in Walking in Portugal and tagged Porto, Santiago de Compostela, Way of St. James, WWWP5K. Bookmark the permalink. Como o meu Inglês não é o melhor, quero fazer um pequeno comentário mas em Português. Gostei imenso de ver estas fotos porque dão uma ideia daquilo que é esta magnífica região de Portugal. O Fotografo é sem dúvida uma mais-valia para este blog (claro que os figurantes também não ficam atrás). Excelente exercício de promoção para esta região sempre num Inglês excepcional. Mt. Obg! É sempre bom receber comentários dos portugueses e como eu adora esta região e vivo cá tive de falar nas coisas mais bonitos que existem. Ainda vai haver mais….! Realy loved your post. I´m from Oporto and I try to promote what´s good in Portugal with my blog http://www.dani-monteiro.blogspot.com. Hi Daniel, Tks a lot for your nice comment. Just had a look at your blog too and its really great will definitely follow you too! We gotta keep blogging to spread the news about what is so beautiful in this country! Thank you again! Hi, you can do the walk either with a group or just a couple whatever. The one from Porto can be done ‘slowly’ which I am doing but through the coast (can’t get all the time off work to do it) and others can be done in a week to 10 days. I plan to do the centre route next year with a Portuguese group Terra Verde but again on the slower basis which promises to be fantastic. There are good sites giving really good and useful info on what to take and which routes – all helping the traveller. If you need anything further let me know. Mum has really enjoyed reading your blog.Very well written. Well done! Loved every minute. Any one depating aporto ion 4 may 2015? Hello Geoff, unfortunately not that I know of. I am already in Spain in my 4th walk this time through the central route but I can only do in sectors as I am working. Certainly if I find out about someone I’ll let you know. But I should say that there are many people every day travelling so you wouldn’t be alone. I strongly suggest you should go anyway if you plan to do it right the way through to Santiago which will take several days. Good luck! Lovely Blog. So much great information. Must keep my head up when walking so I don’t miss anything. Planning on completing the Portuguese Coastal Way in September of 2017. We are all fairly fit and can walk long days (I know it’s not a race ). We’d rather not hurt ourselves trying to get to Santiago. If you had to hop on a bus for a day, where would you do that? Or do you think a fit person could do up to 35 km in a day 😉 We have from September 13 (leaving Porto) to September 22nd when we hope to arrive in Santiago and catch the evening Mass. Then off to Finisterre on the 23rd then homeward bound on the 24th back to Canada. So, ten days walking. Any suggestions? Words of encouragement? 🙂 Thanks for your time.